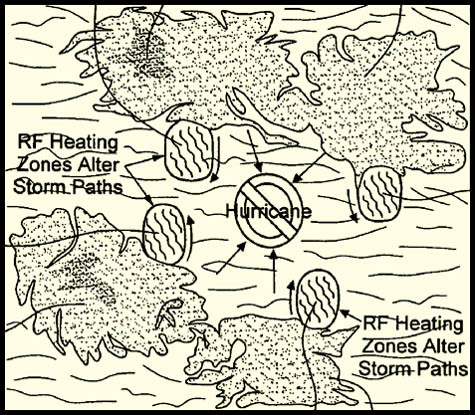 [Image: From a February 2006 patent application by SolarEn, proposing that terrestrial weather systems might be controlled by mirrors in space]. It was reported yesterday that a California solar energy firm – SolarEn – hopes soon to construct "orbiting solar farms" that will harvest electricity in space. Each "farm" would be "a set of solar panels in outer space that would beam enough clean energy back to Earth to power half a million homes and could one day potentially help save the planet," according to the Guardian. SolarEn's specific plans are to put "an array of solar panels around 22,000 miles above the earth's equator using existing rocket technology, and then convert the power generated into radio-frequency transmissions. The radio waves would be beamed back down to antennae in Fresno, California and then converted into electricity and fed into the regular power grid." [Images: From SolarEn's February 2006 patent application]. 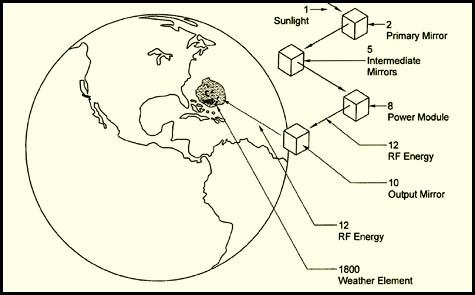 Using a complicated geometry of spaceborne mirrors – seen in the diagrams below – in tandem with meteorological tracking technology, this device would give SolarEn the ability to control the weather. Power system elements are launched into orbit, and the free-floating power system elements are maintained in proper relative alignment, e.g., position, orientation, and shape, using a control system. 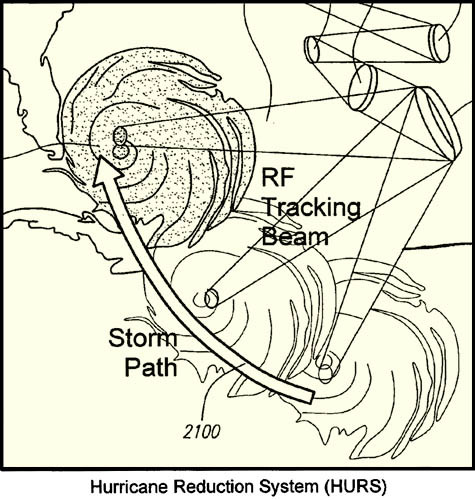 Energy from the space-based power system is applied to a weather element, such as a hurricane, and alters the weather element to weaken or dissipate the weather element. The weather element can be altered by changing a temperature of a section of a weather element, such as the eye of a hurricane, changing airflows, or changing a path of the weather element. Weather control has become a topic of near-constant interest for me. As I suggested the other night in my talk at the SVA – and as I also explore in The BLDGBLOG Book – weather control could very well be the future of urban design; in other words, cities might very realistically attempt to engineer specialty microclimates – similar to Beijing's Olympic efforts at weather control last summer – as a new means of attracting new residents and future development. What's fascinating about SolarEn's proposal is that it seems entirely possibly that, for instance, Dubai, attempting to recapture the international imagination, might put into orbit a private, geostationary solar farm with which that city could not only power its delirious experiments in beach refrigeration and large-scale air-conditioning, but actually create a new climate for the city. 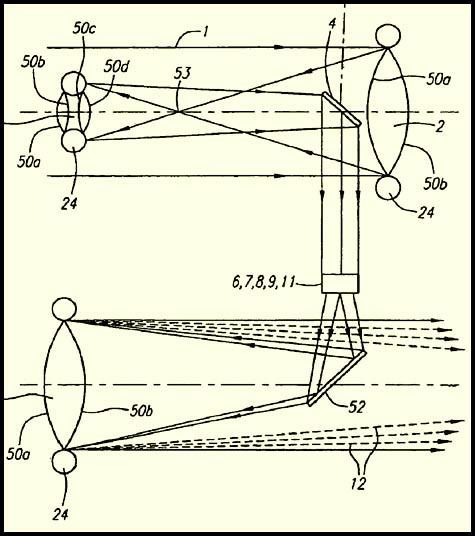 [Image: A geometry of mirrors in space, from SolarEn's February 2006 patent application]. That, of course, or it's just Real Genius all over again: after all, why use this technology only for stopping hurricanes when you could melt an opposing army's tanks or even assassinate someone through a brief application of solar overload? We'll just militarize Apollo, bringing astronomical power down upon our enemies, causing storms of fire in distant cities, evaporating reservoirs, and turning glaciers into roaring torrents of weaponized floodwaters. 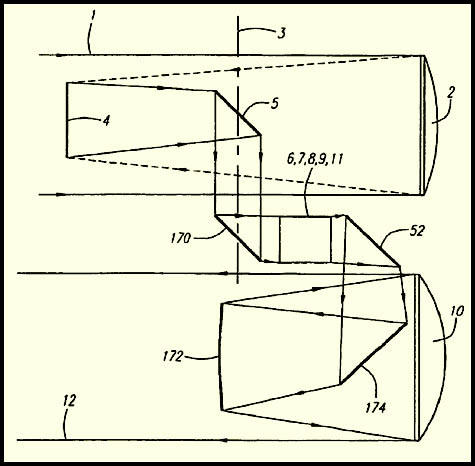 [Image: From SolarEn's February 2006 patent application]. In an endlessly fascinating article published two years ago in The Wilson Quarterly, historian James R. Fleming describes – among many other things – how a "weather race with the Russians" was fought on the level of climatological R&D between the U.S. and U.S.S.R. during the Cold War. For instance, "In the 1940s," Fleming writes, "General George C. Kenney, commander of the Strategic Air Command, declared, 'The nation which first learns to plot the paths of air masses accurately and learns to control the time and place of precipitation will dominate the globe.'" Indeed, the U.S. military ultimately hoped that it might learn how to "alter the global climate for strategic purposes," something which not only involved "using weather as a weapon of warfare," but "using controlled precipitation as a delivery system for biological and radiological agents." You could snow anthrax, say, onto the streets of belligerent cities unaware of the infections drifting down from above. But perhaps all they need is a strange new constellation of mirrors – a remote-controlled blur of light that moves against the stars it's surrounded by – to hurl typhoons against China or destroy a whole civilization's agricultural base from above. Of course, having said all that, I don't mean to imply that SolarEn's weather control system is some kind of paranoiac Doomsday Device; but anyone who learns to stop – or, more to the point, conjure up – hurricanes from space will nonetheless be sitting on an unimaginably powerful technology. How cool is that. Soon we will be getting american hurricanes over here in the UK. I just can't wait. As I mention on my blog www.RepublicofLA.blogspot.com I first heard of this idea in sixth grade. Glad it's starting to move toward becoming reality. Linked back to your posting; hope that's okay. As far as I know it is IMPOSSIBLE to send energy through radio waves. The entire idea is ridiculous. The weather controll by changing temperatures in specific areas sounds posible, but there are so many potential problems i don't know where to start. Good thing this is theoretical or I might be worried about the IQ level of our leading scientists. This idea is on the scale of being biblical though. Something similiar , hasn't anyone seen the military's new microwave riot control device? Its getting warmer to that scale. Destro and Cobra Commander would be so excited! For colorblynde: any form of electromagnetic radiation, such as radio waves or even light, can transmit energy trough empty space. The higher the frequency, the more energy EMR carries. It's a matter of finding way to capture a significant portion of the EMR emitted by a source. The creation and use of solar energy collectors to actively control the weather globally was proposed to NASA in early 2007. As a test several years ago, a researcher built a small electric powered sailplane, and launched it over a microwave antenna. The sailplane had antenna that collected the energy and rectified it to run the propeller motor. The plane flew under the power of microwave energy. Also, a gyrotron converts electrical energy into microwaves and can send the energy like a laser beam. The smallest one I've found on the internet is 50,000 watts. A mirror 1 kilometer in diameter in space can direct about 1 gigawatt of energy from the Sun. A system of focusable mirrors can direct energy towards or away from areas of the Earth to heat and cool regions globally. A single 1 kilometer diameter mirror can feasibly cost a few hundred thousand dollars to manufacture and deploy (in quantity). The same mirror can be used to transport people and material using the pressure of light itself. A 500 pound object with a 1 kilometer solar reflector can accelerate up to 1,000 miles per hour per day from light impingement alone. As far as I can tell from their website, this company is not based in California, but rather in Armenia. Different continent, I believe.